The Oxford Companion to Family and Local History is the most authoritative guide available to all things associated with the family and local history of the British Isles. It provides practical and contextual information for anyone enquiring into their English, Irish, Scottish, or Welsh origins and for anyone working in genealogical research, or the social history of the British Isles. 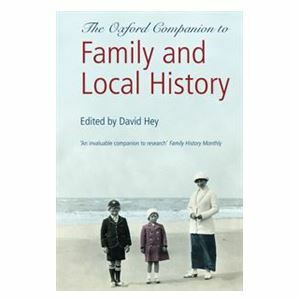 The Oxford Companion to Family and Local History now in its 2nd edition is fully revised and updated and contains over 2,000 entries from adoption to World War records. Recommended web links for many entries are accessed and updated via the Family and Local History companion website. This edition provides guidance on how to research your family tree using the internet and details the full range of online resources available. Newly structured for ease of use, thematic articles are followed by the A-Z dictionary and detailed appendices, which include further reading. New articles for this edition are: 'A Guide for Beginners', 'Links between British and American Families', 'Black and Asian Family History', and an extended feature on 'Names'. With handy research tips, a full background to the social history of communities and individuals, and an updated appendix listing all national and local record offices with their contact details, The Oxford Companion to Family and Local History is an essential reference work for anyone wanting advice on how to approach genealogical research, as well as a fascinating read for anyone interested in the past.